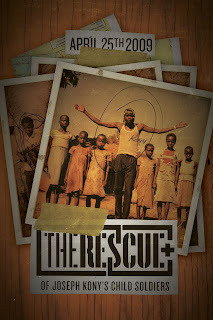 On April 25th, 2009, Invisible Children held The Rescue all over the world (100 cities across 10 countries). The event garnered significant media attention to raise awareness about child soldiers in Uganda. Invisible Children started in 2003 in response to the abducting of children in Uganda who are then enslaved and used as soldiers. I interviewed Brittany Heenan about her experience participating in The Rescue. Brittany is a student at the University of Missouri who is actively involved with Invisible Children and anti-trafficking work. JK: Can you describe your experiences with the Rescue in your own words? BH: On April 25th, I drove to St. Louis, MO and met up with 500 others to sleep under the Arch. We waited and waited. We called political leaders like Claire McCaskill. We left notes at the front desk of Taylor Swift's hotel. We made signs and caught the attention of the media. Finally on Sunday we were lucky enough to be rescued by St. Louis Rams football player, Chris Chamberlain. Immediately, a caravan of devoted Rescue Riders rode to Wichita, KS to wait to be rescued. Finally, over 500 people met at the last city: Chicago, IL. 6 days after abducting ourselves, we choreographed a song and dance to perform outside of Oprah's studio. By this point we were going to be picky. We would not settle for anyone but Oprah or Obama to rescue us. On the morning of the 7th day of being abducted, we headed back to Oprah's studio at 3:00am. Around 5:00am we surrounded her studio, shoulder to shoulder with peace signs in the air. She drove up and invited the three founders of Invisible Children inside to talk about what was going on. She agreed to give us a spot on her show. Friday, May 1 at 9:00am we were finally rescued! JK: What did you learn from this experience? BH: I learned that not everyone is going to understand the point of raising awareness. I learned that getting people involved is not as easy as it seems. But I learned that it doesn't hurt to try to inform these people of the atrocities going on in other countries. JK: What did you take away from participating in the Rescue? BH: This was a life altering experience. I realized that "a bunch of kids" just got Oprah's attention. Which means we have finally reached the hearts of America. This was a huge step towards freeing these enslaved children. JK: What motivated you to participate in the Rescue? BH: Children all over the world are being forced to do things they don't and shouldn't want to do. I can't imagine me at 8 years old carrying around an AK-47. I hated guns when I was 8. I played with Barbies. Why should a child not be allowed to live the life of a child? I've come to realize that I can change this. Me.